You wouldn’t think of the Harper government as warriors fighting Big Business, but in the Great Telecom War of 2013, that’s the position they’re taking. Or maybe it would be more accurate to say they're fighting Big Business on behalf of another big business — in this case, Verizon. The big three wireless players launched a publicity campaign two weeks ago designed to pressure the government to change the wireless rules ahead of a spectrum auction in January that could see Verizon, if it chooses to come to Canada, reap the benefits of rules meant to help new wireless entrants. Under the current rules, set up by the government about five years ago, Verizon, which would have very little Canadian market share to begin, would be treated as a “new entrant” and given the right to bid on twice as much spectrum as the big three, leaving those companies to fight over a smaller share of available bandwidth. The big three want Industry Canada to change the rules ahead of a deadline for spectrum bids in September. “The biased spectrum auction and other major subsidies being proposed for Verizon have all the hallmarks of a political populist initiative to capitalize on a misinformed public view that the Canadian cellular market is uncompetitive,” Fell wrote. 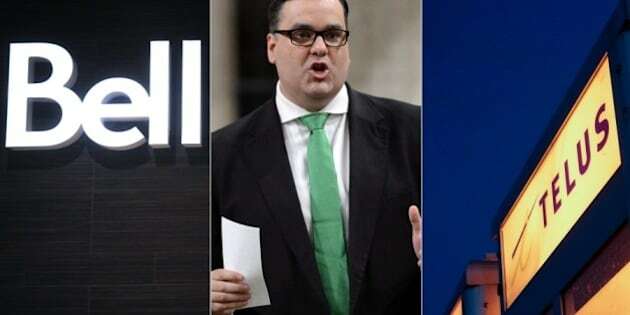 Industry Minister James Moore hit back on Tuesday, issuing a statement calling the big wireless companies’ campaign misleading. That comes as a report in the Globe and Mail — which is owned in part by the same company that owns Bell — suggested that Verizon has been lobbying the Harper government to come to Canada — or that perhaps the government has been actively courting Verizon for that same purpose. Verizon “decided to take a hard look at investing in Canada’s ... wireless market following a key meeting with the federal government in late May,” the Globe reported. Members of Verizon’s mergers and acquisitions team met with Industry Canada officials on May 21, according to the Globe. Little more than a month later, the U.S.’s largest wireless provider reportedly made a $700-million bid for Wind Mobile, one of Canada’s three small wireless companies. Tech blogger Peter Nowak points out that time is running out for Verizon: It has to submit its spectrum bid by Sept. 17, or risk being left out of the crucial auction. It's not only the big three who oppose Verizon's possible entry into Canada. The Communications, Energy and Paperworkers (CEP) union has come out against Verizon as well, arguing that it would harm Canadian workers. The union has also argued Verizon would likely spy on its Canadian customers, given recent revelations of its mass sharing of email data with the U.S. National Security Agency. The Telecommunications Workers Union, which represents Shaw and Telus workers, added its voice to the opposition to Verizon on Wednesday, arguing the company's arrival would not guarantee lower cellphone bills, and would serve lucrative urban markets while ignoring Canada's rural population, the Canadian Press reported.